Alright so let me preface this by saying, I am not a pro macro coach! While I am learning more every day, I certainly don’t know it all! BUT what I do know is that getting an idea of what your macros should be can help you maintain a healthy lifestyle while still indulging in things you love! There is so much flexibility when it comes to counting macros and that is why it is a “diet” I can keep up with. Although it isn’t really a diet. It is more of a mindset and lifestyle. A diet restricts you to certain foods, but macro counting doesn’t do that! It just gives you resources to understand how much of a splurge is within your limits. You can calculate your macros online or you can always reach out to a professional at your gym who can help you develop a set of macros that are a good fit for your activity level, height, weight, age, goals, etc! Counting macros helps me to keep track of what my body needs and how the foods I am eating are serving me. I aim to eat a high protein diet with carbs following closely behind and fat relatively low. I will switch it up and eat more carbs on days when I know that my workouts will be more strenuous… aka leg day. Over the past year I have developed a workout schedule that really fits my lifestyle! It incorporates things that I like and is sustainable for me without making me feel tired and overworked. I normally take my day off on Friday evenings, but I give myself the freedom to move my free day around when weeks are busy or when I am traveling. Orange Theory is my “me” time. I love the competitive nature of the class and being in a group setting twice a week drives me to push myself even more. I think it is really fun! 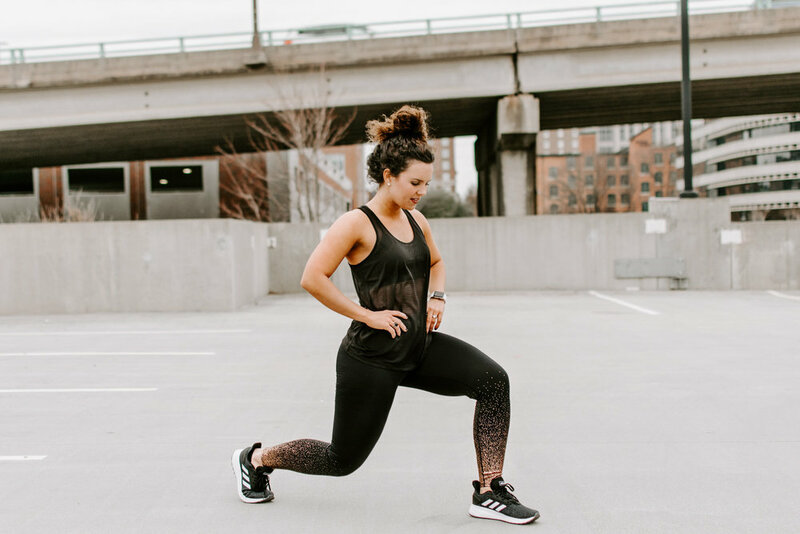 For you, that class might be a spin class at your gym, a pilates class at your favorite studio, Pure Barre, a long walk outside or a yoga session on your porch. But whatever it is, commit to it and use it as your time to think, relax and enjoy yourself! Physical activity looks different for everyone. I have been using Madeline Moves workouts for about a year now and I really like them! Follow her on IG for more info about her guides, macro coaching and fitness in general. She has educated me so much! Her guides helped me develop a schedule that I have come to love and see results from! Everyone likes different forms of exercise and there truly is no “one size fits all” when it comes to fitness. I would suggest trying out different types to see what suits you. I have had great experiences with cycling and kickboxing. I love a good reformer pilates class. Every now and then i’ll sign up for a 5k, 10k or half marathon just to push myself to run more. My point is: there’s something out there that will get you moving AND smiling! Good luck finding it!